Some years later a street was named after him – the only person so honored in the downtown core – and soon Hinton Avenue will spring back to life as part of the Courthouse Square reunification project. Earlier parts of this series traced Hinton’s life of infamy in the 1850s: Robbing the U.S. mail, bail jumping, living as a fugitive while becoming a bigamist. Not a word about any of that ever appeared in Santa Rosa’s weekly newspaper, The Sonoma Democrat – although when he ran for county judge in 1859, papers in San Francisco and Sacramento pointed out that his background as a well-known crook was no qualification to wear a judge’s robe. Losing that election was a rare setback for him; Hinton otherwise glided over every bump he encountered and not because of luck. Otho Hinton seemingly possessed both brains and a hypnotic charm, qualities which made for a perfect con artist – which indeed he was. But Santa Rosa didn’t bestow a street name because the City Council decided it would be jolly to honor a celebrity criminal; it was presumably because of all the good deeds listed in the obituary – the cemetery, the plaza, the fire department. Yet in the newspapers of the time there is not a speck of evidence that Hinton had a significant role in any of those accomplishments. Never before being someone who hid his light under a bushel, he surely wasn’t stricken with modesty once he actually began doing selfless acts. No, more likely he was given undue credit because he did what he always did: He looked you in the eye, oozed with sincerity and graciously allowed you to think the better of him. 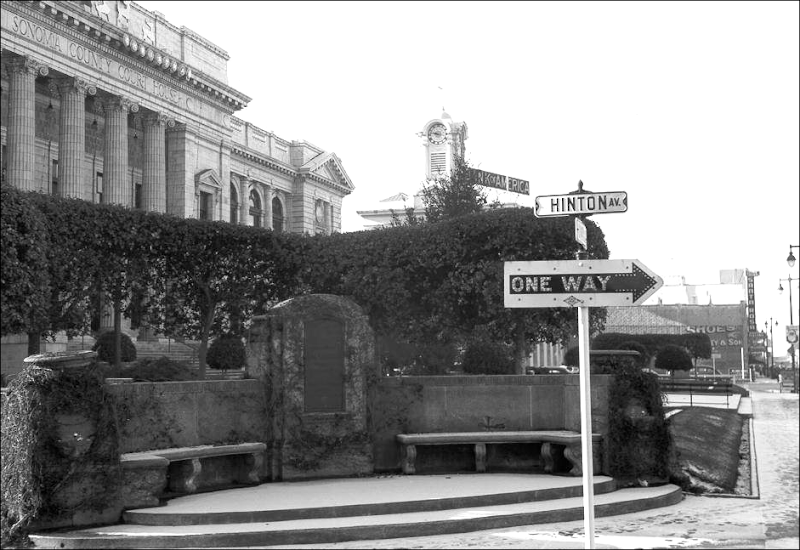 Evidence of Hinton’s great good deeds should be easiest to find in regards to Courthouse Square, but before getting in to that, a quick tour of Civil War-era Santa Rosa is needed. All Hinton actually did, according to the 1861 -1863 newspapers, was to pay some guys to do spring cleanups. If there was anything specifically done, editor Thompson – the #1 booster of the Plaza – somehow overlooked it. That terse “please call at Gen. Hinton’s office” is the only thread linking him to the cemetery at all. We don’t know what what he was doing: Forming a committee, signing up volunteer labor, or, lord help them, collecting donations – remember, there is no certainty that folks in Santa Rosa knew his history of stealing money. There is a traditional story that Hinton did the road layout while August Kohle, a well digger, did the actual work of grading the paths. It’s possible; someone had to mark the trails out around that time, and hammering markers into the ground isn’t exactly heavy lifting. Peg this claim as a maybe. Finally we come to the fire department, where there’s a chance that the old scoundrel actually did a little something to redeem himself. A side benefit of all this Otho Hinton research is that I’ve accumulated enough information on the origins of the Santa Rosa Fire Department to tell that story, which will appear in the following article. Covered here are only the details related to Hinton’s involvement. Per usual, Hinton was given undue credit for good deeds. The obituary thanked him “…[for] the engine house with the fire apparatus of the department, we are especially indebted, for through his indomitable energy and public spirit these all were attained.” More recently it’s been written he bought the town’s first fire engine, which absolutely is not true. Other accounts at the time and over the next few years tells the same story: It was “the ladies” who paid off the debt and financed the firehouse by hosting dances; the first county history in 1880 mentions also “a fair and a festival” and as above, it was broadly hinted they were strong-arming their loving husbands into making contributions. Meanwhile, General Hinton did…something. Everyone just plumb forgot to mention what. 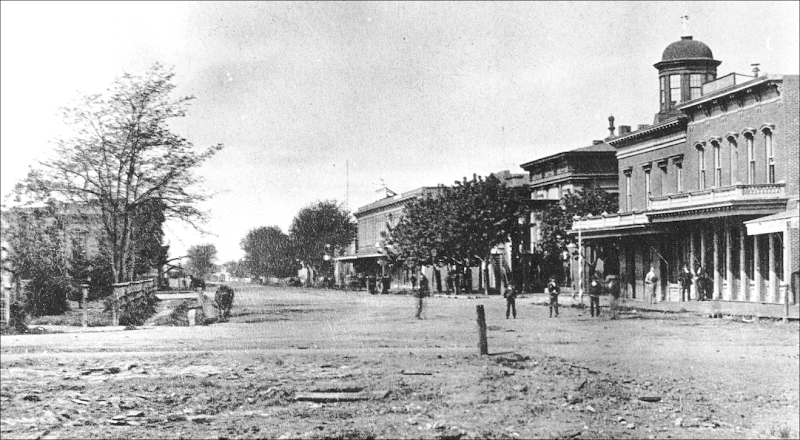 Along with Exchange Avenue, Hinton Avenue was born on July 3, 1872 by order of the City Council. 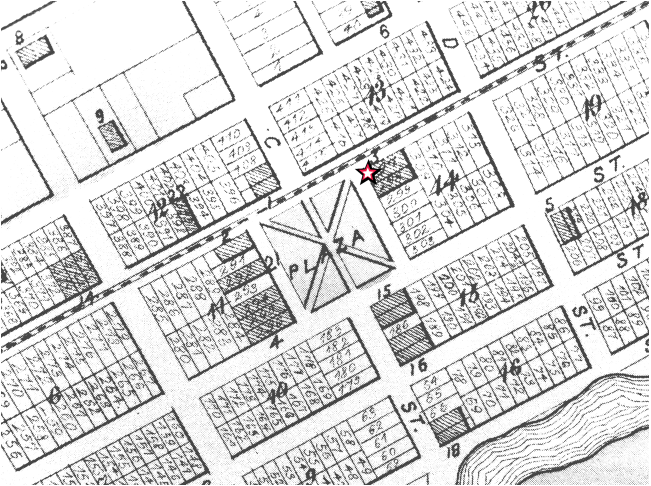 Not that anyone noticed; for many years to come the street was unnamed on maps or sometimes called “9th Ave”, which makes no sense in the town’s street layout. 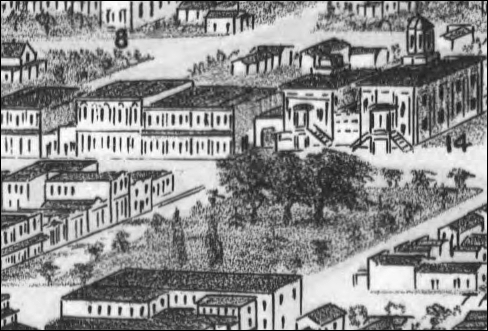 Exchange and Hinton appeared in the newspapers very rarely – ads described businesses as being “east of the Plaza” or “in the Ridgway Block” or “across from the Courthouse,” or similar. It’s as if the town were populated by Missouri hayseeds who thought street names were uppity. Santa Rosa made quite a show of his funeral in 1865 but aside from the street, Hinton’s memory faded quickly; he was not mentioned in any local history until Gaye LeBaron’s “Santa Rosa: a 19th century town.” When his widow, Rebecca, died here in 1882, the Sonoma Democrat didn’t report it and the Daily Republican ran only a one-liner when she was buried. His only lasting presence in Santa Rosa was his portrait, which was apparently destroyed in the 1906 earthquake. At the risk of being completely ahistorical, I’d like to make a modest proposal: Should we consider dropping the Hinton from Hinton Avenue? Maybe we could name it Schulz Ave. or Doyle Avenue (although the other side is already named for his bank). The powers-that-be are itching to name something after recently deceased Santa Rosa nabob Henry Trione, so give him the honor. Or if they are willing to nod towards more appropriate history, call it Muther Avenue, after Santa Rosa Fire Chief Frank Muther who deserves it for saving the town from burning to the ground after the 1906 earthquake, yet currently lies in an unmarked grave. But for the gods’ sake, do we really need to still commemorate a con man who died more than 150 years ago? THE PLAZA.–Gen. Hinton, as is his custom at this season of the year, has had a number of men at work of late, beautifying and improving our town plaza. CLEANING UP.– General O. Hinton, to whom our citizens are much indebted for the very pretty plaza of Santa Rosa, has had several workmen engaged repairing the railing of the sidewalk enclosure, and cleaning and otherwise improving the grounds on the inside. The plaza will be much improved this spring. SUDDEN DEATH OF GEN O. HINTON — General Otho Hinton departed this life at his residence, in Santa Rosa, last Sunday morning, about 10 o’clock. Our citizens were somewhat startled by the announcement of his sudden demise, as he had been seen upon the streets the day preceding. General Hinton was a native of Hagerstown, Maryland, and was 65 years of age. He had resided a long time at Santa Rosa, and to him it may be said, our citizens are alone indebted for all the public improvements about the place. For our beautiful plaza, the well arranged, beautiful, and tastefully laid out cemetery, and the engine house with the fire apparatus of the department, we are especially indebted, for through his indomitable energy and public spirit these all were attained. His death cast a deep gloom over the community, flags were lowered at half mast and the County Court on Monday adjourned in respect to his memory. His funeral took place on Monday, from the M. E. Church, Rev. T. Frazier officiating, and was attended by a large concourse of people. Santa Rosa Engine Company No. 1, whom the deceased had so often befriended, attended in uniform, and by them his remains were consigned to their last resting place. A GOOD PICTURE. — A life size Paintograph of Gen. O. Hinton, deceased, may be seen at the Engine House of Santa Rosa No. 1. It was drawn by Mr. W. H. Wilson, from a photograph likeness. The picture has been pronounced by all who have seen it an excellent likeness. Mr. Wilson has taken a number of pictures at this place which have given very general satisfaction. His art is a very simple one, being a drawing in indelible ink, the entire work being executed with a common pen and very small brush. He is now at Healdsburg.